Simon & Schuster, 9781451641073, 464pp. An award-winning investigative reporter reveals the troubled history of the LAPD in a gripping story filled with hard-boiled, real-life characters that bring to life the ravages of the criminal justice system. Vividly drawn and character-driven, Blue is simultaneously a drama of cops, crime and politics, and a primer on American police policy and reform. Using the LAPD as the book’s spine and through-line, Domanick illuminates urban policing at a crossroads during the tumultuous violence-plagued years of the early 1990s. Years when the beating of Rodney King and the LAPD’s brutality sparked the 1992 Los Angeles Riots, and police departments were caught between an often brutal, corrupt and racist past, and the demands of a rapidly changing urban population and environment. From LA he then zooms to New York City, and details how the transformation of the NYPD that resulted in a dramatic decrease in crime—even while the LAPD remained in freefall for a decade more before it too begins its road to reformation. Blue ends in the summer of 2014 with crime at record lows, but events in LA, NYC and Ferguson, Mo., raising alarming warnings about aggressive racial profiling and the militarization of American policing. Filled with political intrigue and cultural and racial conflict, Domanick’s fast-paced account distills this history through the vivid characters that shaped it, from America’s premiere police reformer, William J. Bratton; to Daryl Francis Gates, Chief of the LAPD during fourteen of the most tumultuous years in LA’s history; to Charlie Beck, a street-hardened LAPD cop who later becomes Bratton’s protégé; to Alfred Lomas and Andre Christian, former members of two of LA’s most fearsome gangs, who represent the other side of the LAPD’s war on crime. An award-winning investigative journalist and author, Joe Domanick is Associate Director of the CMCJ and West Coast Bureau Chief of The Crime Report. Among his books, To Protect and Serve: The LAPD’s Century of War in the City of Dreams won the 1995 Edgar Allan Poe Award for Best Nonfiction “true-crime” book; Cruel Justice: Three Strikes and the Politics of Crime in America’s Golden State has been assigned reading at Stanford Law School, and was named one of the best books of 2004 by the San Francisco Chronicle. "Blue weaves a compelling, fact-filled tale of a turbulent city in transition and a police department that often seems impervious to civilian control." 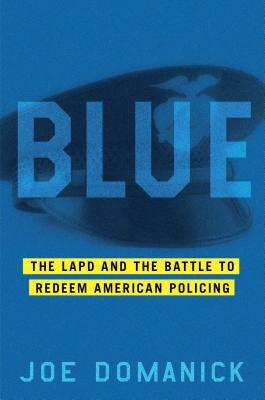 "Racial conflict, urban violence, and big-city politics tangle in this intricate, incisive study of reform in the Los Angeles Police Department...Multifaceted, even-handed, sharp-eyed, and plainspoken, this gripping narrative is one of the best investigations yet of the explosive issue of police relations with minority communities." "Stupendously timely and written with a finely calibrated understanding of the city’s history, and its unique cultural interweave, BLUE’s page-turning narrative is borne aloft by a string of vivid nonfiction characters, including, of course, the agency’s most recent chiefs, Bill Bratton and Charlie Beck. But, while the heart of the book is a grand tale of the multi-layered struggle to reform the LAPD, Domanick also uses LA’s police department as a lens through which to examine the state of U.S. policing in general, and the crossroads at which it has presently arrived." "[An] opus...By his scrupulous research, and in his forceful writing, Domanick makes it clear that even with a Bratton or a Beck at the helm, there are no easy answers for the issues and problems confronting all big city (and small — look no further than Ferguson) police departments today...Our nation’s police departments have been broken for a long time; as Domanick makes strikingly clear, fixing them will take commitment, determination, innovation and endurance. A good way to start should be adding a copy of “Blue” to the syllabus of every police academy in the country."